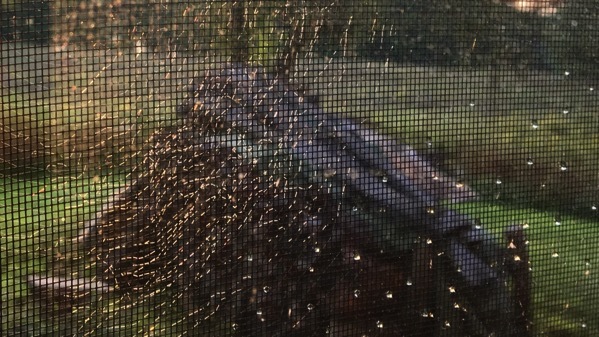 I’m not sure that the spiders who festoon the window screen are all that successful. Makes a pretty pattern, however. We took a pre-cocktail stroll down to the beach to see the waves rolling in (kinda). They were pretty tame compared what Florence is kicking up in the Atlantic! I spotted a swimming leech from the dock and zipped back to dry land to divest myself of shoes and socks. Took me a while to find it again. Several attempted tosses and I lost “him” in the water, then found “him” again a few minutes later. Still wasn’t sure if I managed to throw “him” out of the water (hope so). 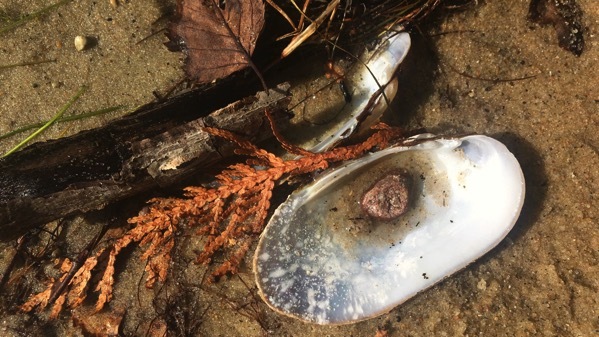 And, yes, the pebble was in the shell when I found them among the wrack. This entry was posted on Tuesday, 11 September 2018 at 6:24 pm.